Length (stowed): 17 ft. 10 3/4 in. Width (stowed): 6 ft. 4 5/8 in. Height (stowed): 7 ft. 4 in. Platform Dimensions: Length: 6 ft./Width: 30 in. 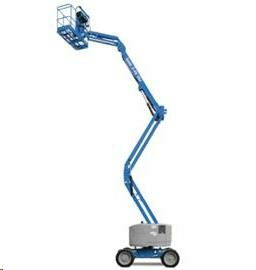 Max Platform Height: 45 ft.
Max Horizontal Reach: 23 ft.
Max up-and-over clearance: 21ft. 7 in. Wheelbase: 6 ft. 3 in. Minimum Turning Circle Outside: 14 ft. 9 in. Minimum Turning Circle Inside: 6 ft. 8 in.